General liquid removal from gas streams. Liquids protection for inlets of compressor engines. Liquids removal before river crossings and low points in pipelines. Used in hilly terrain where liquids can collect and cause slug flow. 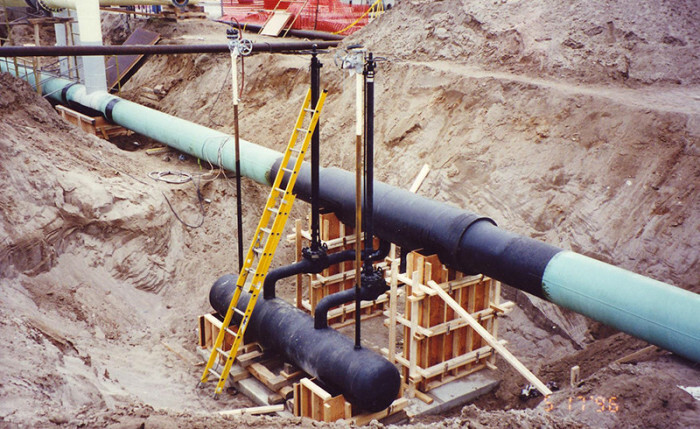 Managing slug flow within a pipeline gathering system. Cavern storage liquid removal and fill (bi-directional). Compressor lube oil removal to protect downstream pipeline. Production and well test separators. Liquids removal before ultrasonic gas meters to maintain accuracy. Steam condensate removal from steam lines. Mitigate upsets in processing plants due to liquid carryover. Small footprint – easy to install in plant upgrade systems. Large gas pipeline power station gas supply. Used to remove condensate from rich gas that is produced at their refineries. Removes liquids from a gas stream to improve accuracy of ultrasonic gas meters. Bi-directional application at large gas compressor or for cavern storage. Remove liquids from a gas stream to improve accuracy of ultrasonic gas meters. Lube oil removal after compressors. Removes glycol carry-over from dehydration systems. Portable well test skids to remove liquids prior to metering. Improves efficiency of large inlet separators to process gas streams. Removes excess MDEA prior to gas desiccant regeneration. Remove corrosive liquids from high pressure distribution pipelines. The Pipeline and Gas Journal, March 1st, 2006. Van Beugen identifies causes of formation/ They include sour gas, liquids and just accumulations of mill-scale. Effects of black powder in pipeline systems range from:accumulations of black powder in low spots (sometimes caused by pigging, and potentially leading to false smart-pig wall thickness readings); wear on elastomers in the system or on pigs; irregular pig velocities leading to data loss and tool damage; decreased efficiency; decreased product quality; downstream equipment fouling. Black Powder is a problem because it can damage all sorts of components in a system. Conventional filtration, separation and magnetic solutions offer the cure while, for over 20 years, Innopipe offers the prevention of the problem in the first place by removing the liquids required for black powder formation. Innopipe has no filters to plug, no filter element changes, no reduced production, no restrictions, less stress on interdependent systems, less horsepower losses, while remaining bi-directionally piggable. The constituents of Black Powder range from metallic elements to bacteria-produced material to silica and calcium. These abrasive or corrosive materials tend to form in the presence of liquids and manifest themselves often as iron sulfides and iron oxides. Therefore, strategic placement of the Innopipe in your transmission system can prevent the formation of black powder before it becomes a problem. Although Innopipe offers an excellent solution for mitigating formation of the powder, it should be understood that a while pigging intervals likely can be reduced, they will still be necessary, and Innopipe efficiency can be further enhanced by the inclusion of additional filtration systems such as magnetic solutions, integrated with our system. Your Innopipe solution provide will be glad to walk you through these available system options. Steam generators provide both vapor and liquids to pipelines. Producers pay particular attention to insulation of steam lines for this reason. This variability can be dealt with using steam separators which are expensive due to their required size required for conventional 2 phase separation. Innopipe offers an economical option due to its relatively small size and great efficiency. Innopipe can be designed and built to match your piping’s specifications and can be built as a fitting for smaller diameters or a very economical pressure vessel for larger line sizes. These can be built to be either piggable or non-piggable also, depending on location and preference. We look forward to helping you optimize delivery of steam to your system.